For the treatment and control of adult and immature roundworms, lungworms and bots in horses. 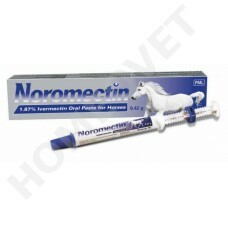 Noromectin 1.87% Oral Paste for horses. Kills the adult and larval stages of the important internal parasites of horses. Contains ivermectin. Suitable for foals and pregnant mares. kills the adult and larval stages of the important internal parasites of horses. These include small redworms which can be resistant to benzimidazole-based wormers, the arterial stages of the large redworm, lungworms and bots. Horses and Donkeys of all ages, including young foals, pregnant mares and breeding stallions have been treated with no adverse effects on their health and fertility. Suitable for foals and pregnant mares. Noromectin 1.87% Oral Paste for Horses has been formulated for use in horses only. Dogs and cats may be adversely affected by the concentration of ivermectin in the veterinary medicinal product if they are allowed to ingest spilled paste or have access to used syringes. Avermectins may not be well tolerated in all non-target species (cases of intolerance with fatal outcome are reported in dogs, especially Collies.Old English Sheepdogs and related breeds or crosses, and also in turtles/tortoises. Do not use in dogs or cats as severe adverse reactions may occur. Noromectin 1.87% Oral Paste for Horses is administered orally at a single dose rate of 200 mcg/kg of bodyweight. One syringe division of paste should be administered per 100 kg bodyweight (based on the recommended dosage of 200 mcgg/kg). Each syringe delivers 140 mg ivermectin, sufficient to treat 700 kg of bodyweight. The tip of the syringe barrel should be inserted at the interdental space (the gap between the front and back teeth). The horse's head should be raised for a few seconds after dosing. Horses' weight should be accurately determined for the correct use of the paste. The animal's mouth should be free of food to ensure swallowing. For best results all horses in a yard or grazing together should be included in a regular parasite control programme and treated at the same time. All horses should be included in a regular parasite control programme, with particular attention being paid to mares, foals and yearlings. Foals should be treated initially at 6-8 weeks of age and routine treatment repeated as appropriate. Retreatment should be carried out according to the epidemiological situation, but not less than at a 30 day interval.